Typically, you will notice the surefire signs that you’re having roof issues, such as leaking water inside, water damage in the attic, or water spots/stains on the ceiling. The best way to avoid these unpleasant surprises is to have your roof inspected twice a year to ensure it’s performing well and catch any potential issues before they’re a bigger problem. Does leaking water always mean I need a new roof? While it may not necessarily mean that a new roof is in your future, leaking water always demands professional attention. It may be a small issue that can be easily resolved, but only an inspection by certified experts ensures that the issue is identified for resolution. Call us 24/7 if you have an active leak! We can often perform an assessment of your roof without you being present, but we generally recommend that you’re on site at some point while we’re there so that we can share options and suggestions that we identify. This also lets you ask questions real-time. Our 20 years of experience in the commercial and residential roofing business has allowed us to work with many different products and manufacturers. We can expertly install and repair everything from asphalt shingles to wood shakes, sheet metal to TPO roofing, and more. Call us to ask about a specific roofing material. There are many variables to consider when pricing a new roof, including materials used and seasonal demand for labor and supplies. It’s a good idea to get three estimates for the job so that you have options to consider. We will then walk you through how to get the best value for your investment, and can offer suggestions for meeting your financial and roofing goals. Will roofing materials block my driveway or garage? We will ask you to clear your driveway for easy delivery and removal, but will load materials directly to the roof. We do not leave materials blocking access to your driveway or garage. Should we need an alternate location for materials, we’ll discuss it with you and come up with a solution that is convenient. 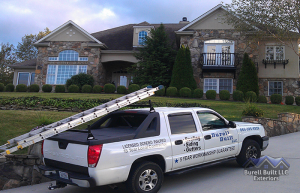 Most residential roofing projects take only a few days. However, if you have a complex roof structure or if we get hit with a thunderstorm, the duration can be longer. But we’ll communicate with you often so that you know what to expect. 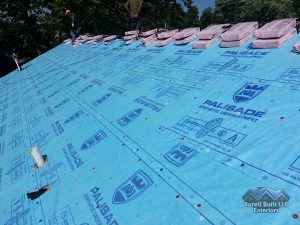 What do I need to do to protect my belongings during a roofing project (replacement)? We recommend taking down all valuable, breakable objects that are hung or on wall shelves prior to beginning the project, as roof replacement requires a lot of hammering. This can pass vibrations through the home and cause objects to fall. Dust and debris can also fall into the attic and garage during this process, so we also recommend covering or storing items with this in mind before we begin. Do I have to be home during my roofing project? No, thankfully! Many homeowners prefer to get away from the hammering noises and busy activity around their home during an installation. Once we’ve discussed the project with you and secured all the details, we can get going and finish the job without you being there. Will roofing material and debris fall off the roof while roof replacement is underway? We work very hard to ensure that all old and damaged roofing material that is coming down ends up only in the roll-away dumpster that we bring on site for the job. It is, of course, recommended to stay alert when entering or exiting a home during a roofing installation, but we make every effort to prevent material from falling off or making more of a mess than is needed. Will I have to be watching for nails after my roof is replaced? As with the clean-up in general, we make every effort and go out of our way to catch debris from the roof (including nails) and do a thorough pick-up before we leave your home. There is always a risk, however, that some nails will elude our team. We recommend taking a quick look at your driveway for nails to avoid tire damage, and you can even get the kids involved by offering a “nail bounty” for found nails. You’re not likely to find much, but this can at least be another set of eyes after our team has performed their detailed cleaning. We hope you found our roofing FAQ to be helpful. Do you have more questions? Great! Give us a call and we’d be happy to discuss more Roofing FAQs and get your next residential roofing project in Knoxville, TN or Chattanooga, TN on the books. Updated on September 16, 2016 at 2:44 pm by Burell Built Exteriors.